No need to bribe me for this edition of the Graph of the Week. 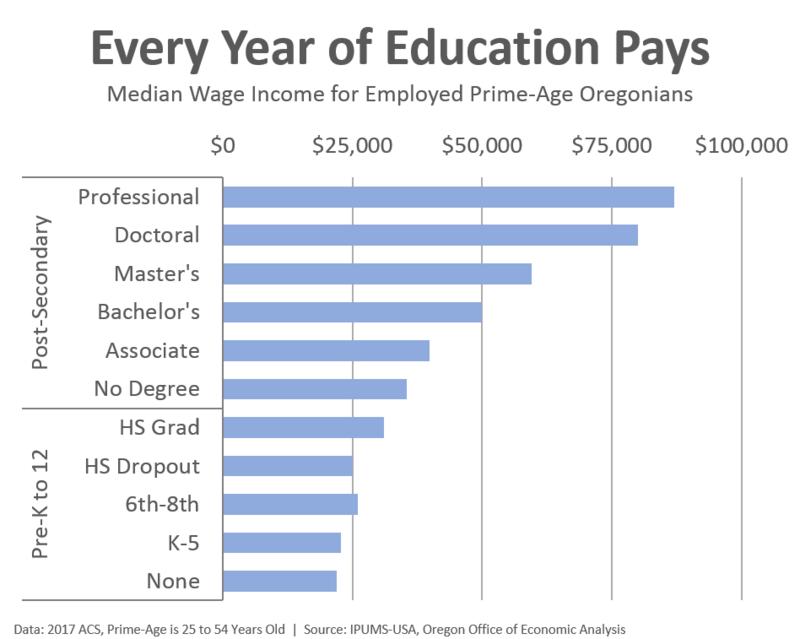 That said, it is clear that every year of education pays off for individuals in the form of higher wages. Most of this is due to increased skills learned in the classroom and the types of jobs someone becomes qualified for. Although some of the gains are likely due to signalling, which is what economists call the fact that part of obtaining a college degree or completing a certificate program is that it signals to an employer that this person can work hard, operate on a schedule, and complete tasks which aren’t so much about technical skills as they are about soft skills and work ethic. Given educational attainment is rising in Oregon (for both the Oregon-born and for in-migrants) this bodes well for future economic growth. The complicating factor of course is student loan debt which has risen in recent decades. The college graduate wage premium has declined some when examining age cohorts, but it does remain near historic highs. That said, it takes longer to repay the costs of college due to rising tuition and the like. And in a seemingly-good-news-but-is-really-bad-news way, student loan debt overall is growing slower. This, however, has to do with the fact that enrollments are down and not expected to pick up until the next recession. Regardless, individuals with more years of schooling on their resumes do earn higher wages in the labor market as seen in this edition of the Graph of the Week.